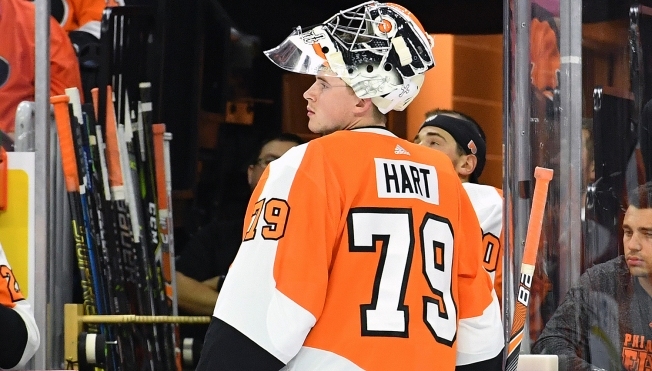 It's the return of Carter Hart. The Flyers' rookie netminder is back in action Thursday night against the Capitals for his first start since suffering an ankle injury Feb. 21 in Montreal. Hart comes into this game with a 13-8-1 record, 2.79 GAA and .917 save percentage. • When: 7 p.m. ET with Flyers Pregame Live at 6:30 p.m.
• The Flyers enter the final 13 games of the regular season trailing the Columbus Blue Jackets by five points for the second wild-card position in the Eastern Conference. Interestingly, the Flyers also found themselves five points back of the Islanders with 13 games remaining in 2017. They finished that season with a 7-4-2 record (.620 percentage) and seven points back of the final wild-card spot. Expect plenty of scoring once again. Both the Flyers and Capitals have scored exactly 33 goals over their last eight games, and have tallied at least three goals in each of those games. • Hart and Capitals goaltender Braden Holtby share the same Edmonton-based sports psychologist John Stevenson, and Hart is looking forward to squaring off against a goalie he has admired over the years. Holtby guided the Capitals to their first-ever Stanley Cup championship last June, and Hart will have similar expectations. He looks really good, solid and I feel like watching him, we kind of play a similar style in a lot of ways where he really uses his skating. It's fun to see a goalie like that. He's got the talent and he's got the mentality. The big thing with him is just make sure you stick with it at this level. Hart will be the fourth different Flyers goaltender the Capitals have faced this season. Mike McKenna made his only Flyers appearance on Jan. 8, allowing four goals in a 5-3 loss. Brian Elliott was pulled after surrendering four goals to the Caps on March 6, and Cam Talbot played 33:27 in relief. • The Flyers will be without forward Jakub Voracek after losing an appeal to have his two-game suspension reduced. Voracek met with NHL commissioner Gary Bettman and the league's Department of Player Safety chief George Parros Tuesday for 75 minutes. Bettman determined the onus was on Voracek to avoid causing a significant blow to Johnny Boychuk's head. • Claude Giroux saw his season-high eight-game point streak end in Monday's 3-2 win over the Senators despite playing 24:40. It was the ninth time this season Giroux has topped the 24-minute mark in a game, all under interim head coach Scott Gordon. However, the Flyers are just 3-4-2 when Giroux logs 24-plus TOI. • Alex Ovechkin became the 49th player in NHL history to reach the 1,200-point milestone with an assist Tuesday night in Pittsburgh. Ovechkin joins Sidney Crosby and Joe Thornton as the only active players to reach that elusive mark. Hall of Famer Bobby Clarke is the only Flyer to reach that milestone, finishing his 15-year career with 1,210 career points.